I’m not sure if I’m a feminist. To be fair, these days there are a lot of things I’m not sure about, but right now, this seems to be at the top of the list. You see, “feminism” has never been something I’ve thought about or prayed about or engaged with. Its existence has always been in the back of my mind, I guess, somewhere in that part of my brain where all of the yes, that is a thing which exists, but that’s all I know about it things live – but that was as far as it went. Until, all at once, it went a lot further. I took a required course on the role of women in the church, and what had once been a non-issue suddenly moved to the forefront of my academic thinking. Soon, it moved from my academic thinking to my heart’s questions. I wrote an angry letter to my old pastor, then I burned it. I read A Year of Biblical Womanhood, and I felt peace. A lot of peace. After the peace, I had a lot more questions than answers. But this time, the questions were tinged with a knowledge that everything would be okay. I subscribed to some blogs. I wasn’t looking for feminism. I wasn’t looking for anything with a name. I read blogs from all across the board. I got mad at Mark Driscoll, so I tried to figure out why. I emailed a feminist I had mutual friends with. I subscribed to more blogs. We ate donuts together and I asked her a million and twelve questions. And now, here I am. I’m not sure if I’m a feminist or not. I’ve done some research, but I don’t have time to fully immerse myself in the study. There are still some things I can’t reconcile, some questions that haven’t been answered, and some implications that I’m not fully comfortable with. I am pro-life, and I am 100% convinced that homosexuality is a sin – those are two big ones. I want to get married and I am pretty sure I want my husband to lead me – but I also know that I want a voice, and that I will not be silenced based on my relationship status. I’m not sure how to deal with the hundreds of people who are smarter than I am, who have interpreted Scripture differently. I am sure that Jesus does not think less of me, as a woman, than he does of men. I am sure that I have been called to serve Him. I am sure that call will not change whether I am married or single. I am sure that justice will not come to millions of oppressed women around the world as long as the Church continues to believe that women are worth less than men in the eyes of their Savior. I am sure that I trust the Holy Spirit to guide my life, and that He has brought this issue to the forefront of my life for a reason. I’m not sure if I’m a feminist, but I might be on the way. I am a little terrified. I am a lot unsure. But I am asking Christ to guide me to freedom as He intended it; to His truth. And I am sure that He will do that. This post is part of the three-day Feminisms Fest linkup, which today is being hosted at Love is What You Do. Please do yourself a favor and peruse the other blogs participating; they are really wonderful and encouraging. 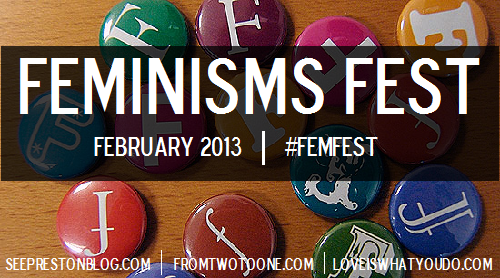 Join the discussion by adding your own blog to the linkup or on Twitter using the hashtag #femfest! It is hard for those who have lived a life of saying “yes” to learn how to say “no.” For those of us who have been consistently referred to as leaders, who have consistently overcommitted ourselves and always, always been there for others, it can be nearly impossible to learn how to be there for ourselves. It can be strange, even terrifying, to ask someone else to be there for us. Removing a mask is a scary process. It leaves us raw and vulnerable, at a point where there’s nothing else with which to hide. This is me. Here I am. I can change nothing else. We attend seminars, take notes, read our Bibles. We teach ourselves, piece by scary piece, how to be vulnerable. Maybe the guard comes down late one night with a roommate or friend. Maybe someone taught us, without us even realizing it, through walks in cornfields and late night hugs. Slowly, we find our identities beginning to change a little. No longer are we “a leader in my home church,” or “mentoring several middle school girls.” Instead, we’re searching for a church as different as possible from the one where we grew up. We’re the mentored instead of the mentor, crying into coffee and eventually signing up for counseling. We’re trying to figure out who we are, apart from those things that defined us. We learn how to be weak. We get lots of practice telling people we aren’t okay. We buy new clothes and learn how to blowdry our hair. Journals, once gathering dust on the bookshelves, are filled with scribbles of this new thing called feelings. Some of our stubborn corners begin to wear off, and black and white start to fade to grey. Questions that were once deemed controversial or scary now fill our conversations. We push back on the theological boundaries of our upbringing. We lie awake at night, begging God to prove Himself and crumpling into tears of awe and gratitude because He always does. Every time. Always grace. So much grace. We’re still there for others. But now, others are here for us. We still like to lead – after all, it’s a spiritual gift. But now, we are learning how to be led. The process hasn’t ended. We are still being transformed. Grace is still being defined in every moment of our lives. We’re learning when to say yes and who we should be vulnerable with. The process isn’t perfect. Yet we can feel Him. He is working in us, transforming us to be more like Him. Breaking our hearts, piece by piece, for the things that break His. He is molding us into something we have been all along: His precious children. In these moments, sometimes I briefly wonder what God is up to, back there behind the scenes. When I look back in my journal, there are a lot of entries that say things like, “God, I really don’t understand what You’re doing here.” Those moments tend to pass quickly; a fleeting thought or scribbled sentence, soon replaced by the next thing demanding my attention. I’ve got that feeling again. The feeling that maybe God is planning a surprise party for me. My course load is light this semester, I’ve made contacts and networked in ways I never dreamed of, and there are loads of new freshmen for me to meet. My best friend is here now, at my college, in my city. The student group I’m in is going in new directions. I’ve read three or four books about radical living and sacrificial giving in the past year, I changed my major, and I finally have a home church. Basically, I’m starting to get suspicious. Starting to wonder why (to stretch the metaphor probably too far) God keeps whispering when I leave the room. I’m beginning to see things that can’t be called coincidences. Little details have shifted and changed and fallen into place just enough to make me question. My heart is tight in anticipation. I know He’s up to SOMETHING, I’m just not sure what. Every time He drops another little clue, my heart pounds with excitement. Each time I open a new door, I brace myself, wondering if this is it… or if it’s just another step in the process. It seems like everything in my life is changing. There are, of course, the obvious things. My zip code changed from 48746, to 60610, and back again, in the span of nine months. I went from living in a dorm room to living in my room at home. The label of “best friend” jumped from one person to another as my friend group at college grew. I took up journalling and learned to like coffee and spinach. The list goes on and on. And then there are the not-so-obvious changes; the ones that don’t face every college student. The house I’ve lived in since fourth grade is up for sale. When I moved home from college, I deep-cleaned my room with the purpose of making it easier for my parents to pack it up and move it to Saginaw in the fall. My baby brother is going to high school in the fall, ending the era of St. Paul Lutheran School for the Hobson family. I’m at my grandparents’ home in Hillsdale for a few days; my beloved farm #inthecornfields. With each visit, Nana’s Alzheimer’s is worse, and I see the changes in her almost daily. The house I grew up playing with is now outfitted for the senior citizens my grandparents have somehow become, complete with guardrails on the basement stairs and bars in the bathroom. We spent last weekend at Piatt Lake, the place that has been my summer home since before I was born. Surrounded by friends from camp, I laughed from that deepest place inside of me… but even Piatt Lake has changed. As I’ve grown older, I’ve become aware that the place I once thought entirely perfect is, in fact, marred by sin. The place where I have heard God’s voice the loudest and most clearly is also the place where His children have hurt me the most deeply. The waterline is receding, the buildings and footbridge are aging. Where we once spent our summers happily disconnected from the world, we now have cell service on the beach and in splotches around the cabin; and our WiFi will be hooked back up this summer. As a control freak, I’ve never been a big fan of change. In fact, if asked to list my biggest fears, “change” would top the list every single time. Yet change presses in from every side. Change doesn’t care about my plans, my control. Change takes charge and pushes me aside. I’ve spent a lot of time thinking about change since I’ve been home from school. As I thought, cried, prayed, journaled, etc, God pointed me to His Word. I looked up “unchangeable” in the concordance in the back of my Bible, and found these two verses. He was the same when He spoke the world into being. He was the same through the Exodus, through the time of the Judges and throughout all of the prophets and kings. He was the same when He watched His Son come into the world one busy night in Bethlehem. He was the same when He watched that same Son being killed, so that I may have a chance to know Him. He was the same through the beginning of the church, through Paul’s imprisonment, through the Reformation. His character has not changed throughout all of history. Though kings and presidents have passed away, my Savior has remained steadfast. Though wars have been fought, won, and lost, He has not been moved. Though laws have been passed, He remains the same. My Jesus is the only thing that’s constant. Though my life swirls around me, He is the same. Though I may not come “home” next year, He is the same. When Nana doesn’t know who I am, He is unchanging. Throughout the fluctuations of friendships, He remains steadfast. When His children mess up, He is the same. Whether I am on staff at Hiawatha or serving in Pucallpa, He is the same. For all eternity, my Savior is steadfast. He is my only constant. These are all things I’ve told people over the last few weeks. But they aren’t entirely accurate. I’m balancing 17 credit hours, 15 hours a week of work, homework, Puente, 5North Min Team, PCM, some semblance of a social life, and sleep. Actually, “balancing” is the wrong word. It would be more accurate to say that I’m “precariously juggling” all of those things. And then there’s the fact that, as a human being,I’m required to experience a certain amount of feelings. I lost one of my closest friends over Christmas break and I’m trying to find time to just be sad for a minute. I sat in the hallway for over an hour, crying with another friend over her deep hurt. I’ve started counseling to deal with the hurt from our church split last spring. I’m actually homesick this semester, especially for my little brother. There is increasing tension in my group of friends that needs to be dealt with. Between my lack of sleep and the knowledge that each day will bring a lot more stress, it has become increasingly difficult to stop hitting the snooze button. I’m stretched thin, spread out, worn down. If I could wave a magic wand to get anything I wanted, it would be a long weekend on a beach with a pillow, my Bible, my journal, and some music. I long for sunshine and warmth, for the laughter and freedom that summer brings. I want to spend a few days at the farm on Cole Rd, cooking for Nana and Papa, watering the steer, and rocking in the corner of the living room reading old issues of Farm and Ranch. I want to go to East Lansing with Maggie and Jocie and eat at Chipotle and go to Bubble Island and talk for hours. None of those things are options right now. Instead, I snag a few free minutes to journal each day. I take time to breathe and relax before I fall asleep. Coffee is my new best friend, and I’ve started eating breakfast in an effort to have more energy throughout the day. Sometimes I pause to stare at a wall for a few moments. Gospel Community is a welcome time to break out of the “Moody bubble” and share life with people outside of my daily circles. I make myself find joy in the little things. I remind myself that I am a wretched, awful sinner, but Jesus loves me in spite of myself. My roommate listens to me complain. I look at pictures of sunshine and beaches and summer. I hug people a lot. Gramma Kelci gives me frequent back massages. Sometimes, like last night, I drop everything and do something spontaneous with my friends. When none of those things work, I hide under my covers and talk to Jesus until I fall asleep.